Embarking on Murder by Sue Owens Wright, a Mysterious Review. Review: Elsie "Beanie" MacBean is celebrating her 50th birthday with her daughter Nona and her good friend Sheriff Skip Cassidy aboard a dinner cruise on Lake Tahoe on the 4th of July, expecting a brilliant display of fireworks at the end of the evening but getting fireworks of a different, and more deadly, kind instead in Embarking on Murder, the third mystery in this series by Sue Owens Wright. While Beanie is enjoying her meal, another couple, elderly Frank Diggs, his adult children, and his wife of one year Ivy, who just happens to be younger than any of his children, have a loud argument. Ivy is screaming at Frank, demanding a divorce, and otherwise making a scene for all to see. Suddenly the boat seems to run over something, lifting one side up enough to tip over tables and unseating patrons who immediately leave the dining area. Soon after Frank yells that Ivy is missing and he fears she may have fallen overboard. Skip dives into the lake but something yanks on his leg, pulling him down. He manages to free himself, but his pants are in shreds and his leg in need of stitches. Beanie is faced with two puzzling questions: What happened to Ivy? And what was in the water that attacked Skip? Embarking on Murder takes a creative look at a colossal creature that reportedly lives in the great depths of Lake Tahoe and dubbed "Tessie" by the locals, incorporating it into the plot of the story. If Ivy wasn't on board the cruise ship, she must have fallen overboard. But could she have drowned so quickly, or might she have been pulled under just as Skip was. If so, by what? And what caused the boat to suddenly shift to one side, as if it hit something large underwater or was shoved upward from below? 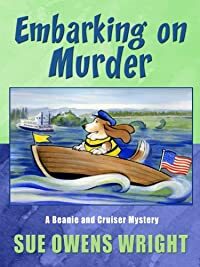 The multiple twists in Embarking on Murder, colorful characters and tense situations, broad humor and the hint of romance between Beanie and Skip, and of course the delightful Cruiser, make this a most enjoyable read. Special thanks to guest reviewer Betty of The Betz Review for contributing her review of Embarking on Murder. Acknowledgment: Breakthrough Promotions provided a copy of Embarking on Murder for this review.